Why US and Australia should pay attention to UK strategy on transnational education? In last couple of years, the UK image among international students has suffered, primarily due to the restrictive immigration policies. Regulatory policies and qualitative issues related to monitoring of overseas students, further acerbated the situation, as exemplified by the case of London Met. In the world of transnational education, the ghost of the University of Wales validation model might have faded from the memory of some, however, it still cautions many others in the profession, who are involved with TNE. Both American and Australian have been engaged with TNE, although with different scope and approaches. In the absence of a national strategy, engagement of American institutions with TNE had been organic and autonomous and can also be characterized as bipolar. At one end of the spectrum are the leading universities like New York University and Northwestern University which have been invited by the host countries and are offered financial incentives. At the other end, are the institutions like Laureate which are aggressively developing markets through its network of universities. In this bipolar arrangement, mid-tier institutions like Michigan State University, which could not find financial incentives nor had a business-orientation towards higher education, have struggled to take-off. Going forward, these mid-tier institutions will find it even tougher to compete with the shared and comprehensive approach of the UK. Australian international education strategy has mirrored the British in terms of market-facing and centralized national policy. It also faced similar issues of balancing immigration policies as Britain. While, Australia also recognized the importance of TNE, it seems to lag behind the UK in terms of sheer depth and width of TNE activity. TNE accounted for about 42 per cent of Britain’s international student population as compared to 28 per cent for Australia. This higher number in the UK, is partly due to a distance learning programs delivered overseas. 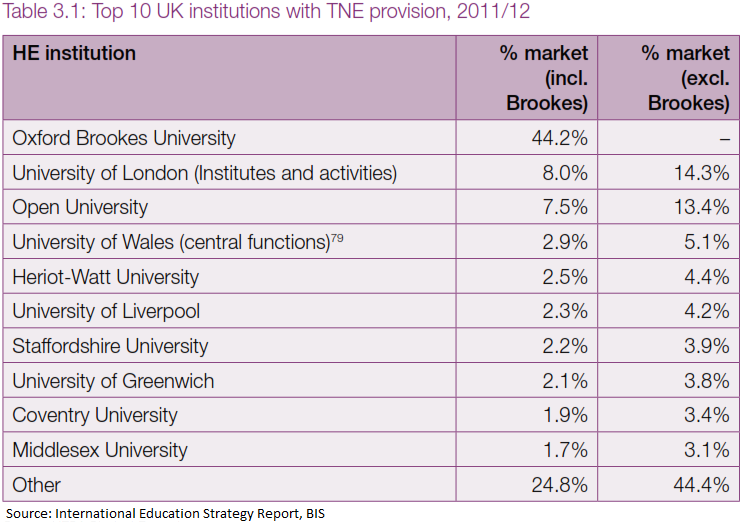 For example, University London and Open University account for nearly 15% of all TNE enrollment for the UK. And then there is Oxford Brookes-AACA program which accounts for 45% of TNE enrollment, but has nearly low graduation rate (~10%). The challenge for Australia is that of integrating alternative models of TNE in their strategy and then executing the strategy with a speed that engages underserved markets. Of course, the path to execution for this comprehensive UK strategy will take time and patience, however, many Australian and American institutions would be taken by surprise, if they ignore the potentially game-changing influence in the international higher education arena. What are your thoughts/comments on British international education strategy?